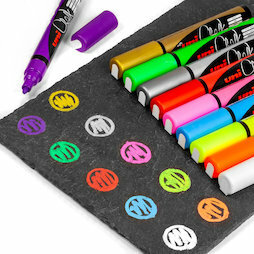 The chalk markers of the uni brand come in a set of 4 and are ideal for writing on smooth surfaces such as magnetic glass boards, whiteboards, wall boards, windows, glass, plastic, and metal. Shake well before each use and push down the tip a few times until it fills with colour. Then you can write away! Please note: Liquid chalk markers are not suitable for use on chalkboard paint. Markers must be closed after each use to prevent the paint from drying out. 1 pc. 4,16 EUR ea. 1 pc. 156,20 EUR ea. 1 pc. 6,10 EUR ea. 1 pc. 65,72 EUR ea. 1 pc. 156,28 EUR ea. 1 pc. 12,30 EUR ea. 1 pc. 20,83 EUR ea.